I want to move on to online sites which allow you to generate images which you can use for visual communication purposes. Some of these generators include comic strip generators, digital characters (or avatars) generator, cross word puzzle generator, book cover generator, etc. Here is my first installment: A "Dummies" book cover generator. 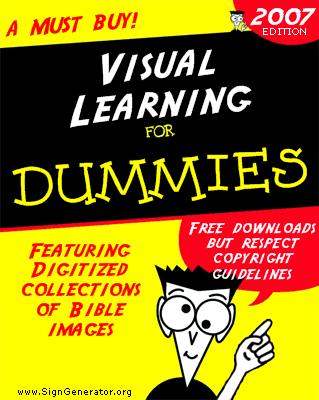 You could try "Genesis for Newbies" "Church History for Dummies" etc. Generate more visual images www.ImageGenerator.org.